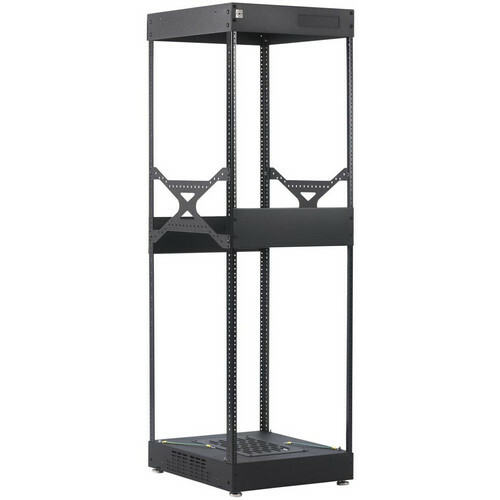 The Raxxess S1 Knock Down Rack (41U / 23" Deep) is designed with self-supporting rack rails and an inherent base that holds the rack rail firmly during assembling, allowing a single individual to assemble it rather effortlessly. Capable of withstanding a load capacity of 500 lb (226 kg), the rack is ideal for holding rack-mountable equipment like cabinets and chassis. A covered venting in the bottom panel offers additional space to mount components and can also be easily detached for cable routing. Additionally, laser cut knockouts are designed to accept conduits and cable connectors. Punched side braces can be used to attach additional rack rails or to tie cables. In addition, the rack rails can be customized depending on your installation. For quick cooling, a built-in blank panel covering the top of the rack prevents warm exhaust air from circulating to the front of the cabinet. Included floor levelers ensure the rack stands at level on the surface.